This is book six in the A Wolf's Hunger series, and wow let's just say this one packs an excellent, intriguing, suspenseful punch. 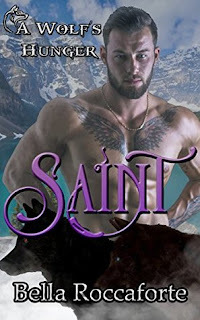 Saint is to become Alpha soon, and his father and others simply are at a loss as to what is up with him. He is just running a muck, causing undo stress for the pack. Scarlet is back on pack land after being sent away as a very young child. Why? Well, I can't give that part, or I may spoil it for you. Strong story line, just the right amount of action and romance. There are many missing words however throughout, and that is why my rating is a bit lower. However with that said I really enjoyed this story. Pick up your copy and find out how these two bring love and healing to each other and those around them. This book was free on Amazon.